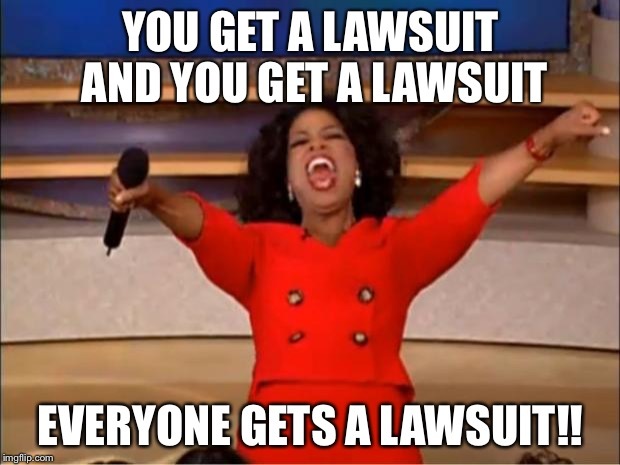 People sue for the darndest things, so after you set out from home today, be careful! Just walking down to your local Spar could cause all sorts of ramifications. You could walk over a pedestrian crossing and the person sitting in his car waiting for you to cross over could sue for you giving him a finger…but all you were really doing is brushing a mosquito off your nose. Really! It happened. Remember, when you brush things off your nose with a finger, do not look at anyone. You never know what trouble you will get yourself into. In New York a woman sued the transport authority and a television network after she claimed a ‘scary’ poster featuring an actor playing a serial killer made her fall down the stairs to the subway, breaking an ankle and sustaining a head injury. The judge didn’t issue a final ruling and indicated he would probably dismiss the case, fearing he would let ‘the floodgates open’. A lady in Chicago said that her packet of mints did not, in fact, contain the amount of mints that she had expected, so she sued the manufacturing company. The case was dismissed out of court. In Vancouver, Canada, a waiter was fired after a patron complained he had been rude to him. The waiter explained he was French and just had a little trouble understanding what was required. The waiter sued the restaurant and won the case. Someone took the claims of an advertising campaign too seriously when they pictured people drinking beer with images of gorgeous women and tropical palms in the background. The claimant said he’d personally never experienced this and sued for false advertising. The case was dismissed. A case in the Netherlands that was widely reported in the popular media involved a man who sued for the right to change his age for a date app. He said if people could change genders, as was commonplace these days, then he had the right to be any age he wanted. The case never got anywhere near court. It goes to show, though, just what could happen when you least expect it. Another one which was really kind of crazy had someone file a multi-million-dollar suit against the two founders of Nike. He said he resembled one of the owners and he said that he was being frequently being mistaken for the baseball wiz. He said he suffered harassment by the public and filed for compensatory and punitive damages for emotional pain and suffering. The claimant eventually withdrew his claim because of public backlash. In this madcap world, it pays you to have the right legal cover which is readily obtainable from aptly named Right Cover. We, as a team of legal professionals can come to your aid when you find yourself in a totally unexpected mess. Expert legal advice on your credit report. Legal assistance with judgements and listings. Criminal offence advice when you need it most. Top labour advice to protect you from employers. Get expert legal assistance, 24 hours a day for as R49pm. As you no doubt figured, there are crazies aplenty hiding around every corner, so you would do yourself well to make sure you have the experts on your side!